Diving American Samoa offers a variety of dive sites from those with the biggest corals in the world, to shallow bays laden with healthy reef ecosystems, to reef walls that fall away from 2 to 62 m – and many sites in between. Many of the dive sites are in marine protected areas (MPA’s), some are in locally protected reserves, and at a variety of depths from snorkel to deep dive, but all have one thing in common – all are in as pristine and as natural and healthy a state as you can hope to imagine. Check out the video which really shows the marine environment to be encountered diving American Samoa. All islands within the territory were formed by volcanic activity at one point or another, and are typified by steep sided slopes which continue down below the water line to depths of 1000’s of metres. All the islands have a fringing reef lagoon and there are numerous shallow bays accessible as shore dives where coral reefs can be enjoyed in just a few metres of water. The Scuba diving industry is in its infancy in American Samoa, but knowing what natural treasures lie in its waters, it will soon become a new frontier for divers who seek more rewarding diving in pristine natural environments. American Samoa’s remote location makes diving American Samoa unique in many respects. Due to the low numbers living on the islands, the relatively low number of visiting divers, and the marine sanctuaries, each of the different coral reefs will be experienced in their most natural state possible. However, taking into account the high rainfall and the potential exposure to weather from the south, it may not be possible to dive every day. There are two full service dive operators on American Samoa. One, Pago Charters offers, boat charters to dive sites around Tutuila and nearby Ta’u. The other, Laumei Diving Inc, offers guided shore dives around Tutuila and Aunu’u. Some dive sites involve a short walk across the lagoon, others a short walk down to the beach from the road’s end. Check out the locations of the dive sites in the section below. A mix of shore dives and boat dives is recommended allowing some flexibility against adverse weather conditions. More details on these dive operators will be available soon, in the meantime, if you want to know who can take you diving in American Samoa, please send us an enquiry. 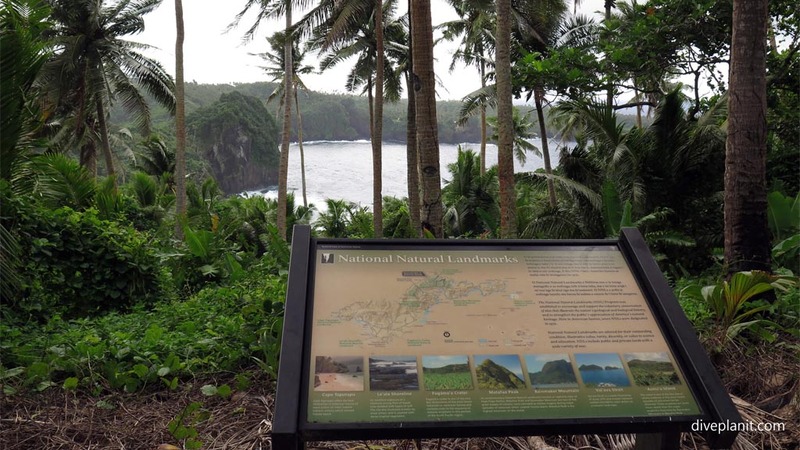 There are three federally protected areas around the main island of American Samoa – Tutuila, one notable privately protected reserve, and three offshore protected areas. 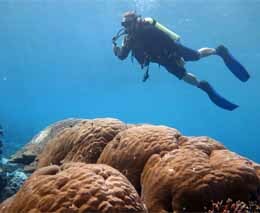 There are also a number of known shore diving and snorkelling spots between town and the airport. The Fagatele dive site below gives a good idea of what much of the diving is like in American Samoa – ie, that you can expect to see healthy undamaged reefs and a plethora of associated reef fish. 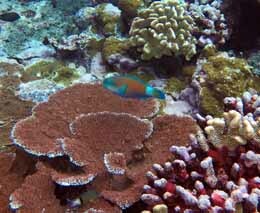 The Marine Sanctuaries page lists all the main sites as well as the offshore sanctuaries. Tradewinds Hotel is located just five minutes from the airport and offers a range of business and recreational facilities including the Equator Restaurant, bar, Internet, a café, and a large outdoor swimming pool. 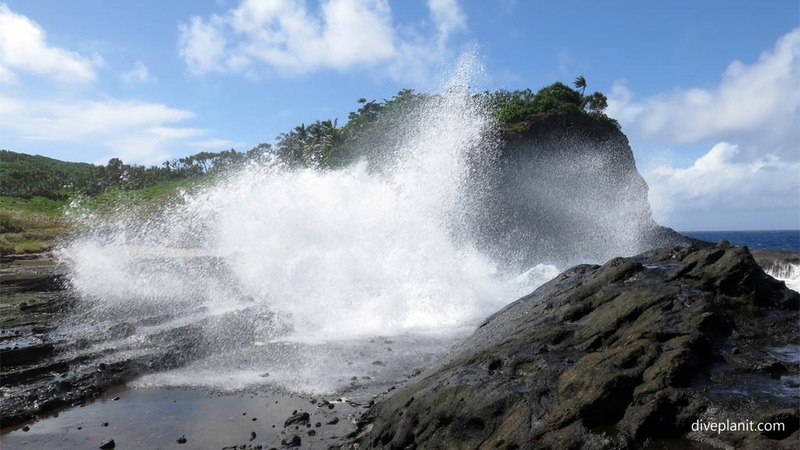 Car rental is also available and it is close to the marine sanctuaries of Fagatele and Fagalua / Fogama’a. 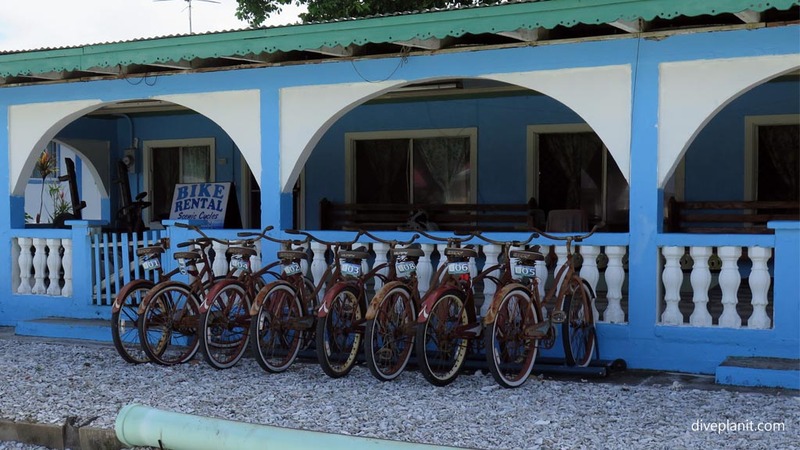 Certainly the most central place to stay is Sadie’s by the Sea, a fine example of Old World Polynesian hospitality. Right in the centre of town, it has its own private beach, a swimming pool, and the Goat Island Café – a popular water front bar and restaurant. The Sadie Thompson Inn offers modern amenities in an historic building at more moderate rates. It too has a popular restaurant ‘Sadie’s Restaurant’ and a bar. Also conveniently located just five minutes from the marina and Fagatogo Square. First things first: coffee! If you’re looking for a genuine Italian roast expresso fix then Bookworm, out at Malaeimi is the only place to go. It also serves delicious cookies made on the premises, subs (French bread sandwiches), has Internet workstations by the hour and also has a wide range of books for sale. The Yah Weh Coffee shop also has expresso coffee and food to eat in or go. 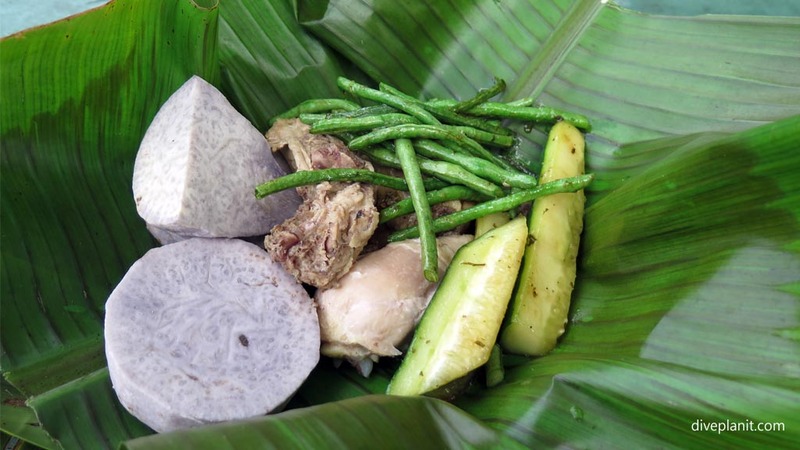 At some point during your stay, you should try the traditional Samoan food: typically taro, vegetables and chicken and/or fish – but all cooked in their own succulent juices. In addition to the hotel restaurants there are a couple of notable restaurants: Sook Sushi noted for, not surprising excellent sushi; Manuia Restaurant in Tafuna serves great Korean food, and DDW Café in Utulei serves American and Samoan dishes. 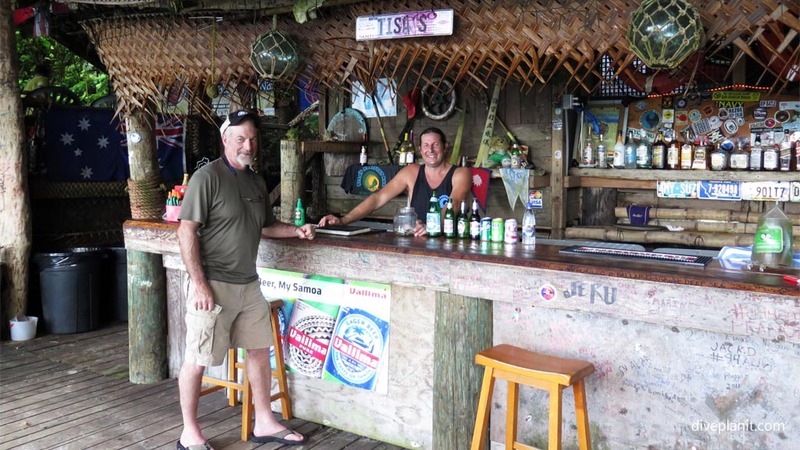 And of course if you’re going to dive there, at least enjoy a drink at Tisa’s after the dive. They also do food and traditional umu – check in advance. Though there are many buses that travel various routes around the island, the most practical transport is via car. Many of the hotels/resorts have cars for rental, and cars can be rented at the airport. Avis has a kiosk at the airport, as do Samoa Car Rental (samoacarrentals@yahoo.com) and Toa Samoa Car Rentals (toasamoa_rental@yahoo.com). Bikes and taxis are also an option. 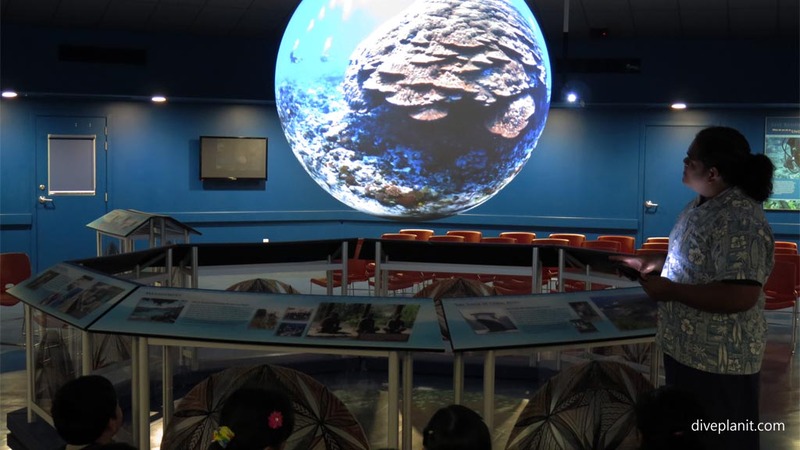 The best and quickest way to get your head around the diving and snorkelling opportunities, as well as find out what each site holds in store for you is to head down to NOAA’s Ocean Center in down town Fagatogo. 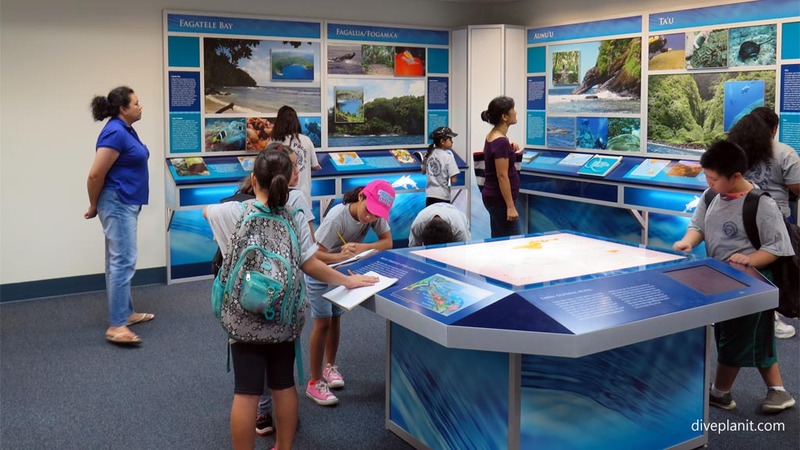 Here there are displays and maps and brochures of all the marine protected areas, and knowledgeable staff to answer any questions you may have. There is also a display called ‘Science on a Sphere’ where 3 dimensional moving image is projected onto a large sphere. 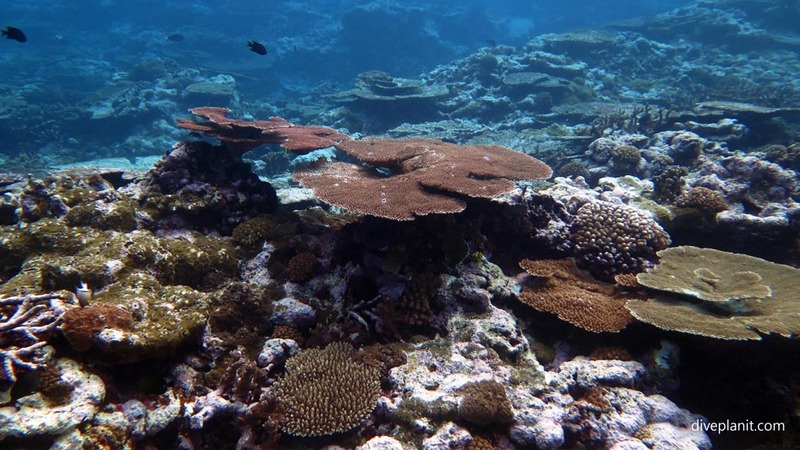 This can be used to show atmospheric datasets, but also underwater datasets such as those captured by the 3D cameras used by the Catlin Seaview Survey to create a “Google Street View’ of coral reefs. Another great place to load up on information and ideas is the National Park Visitors Center. 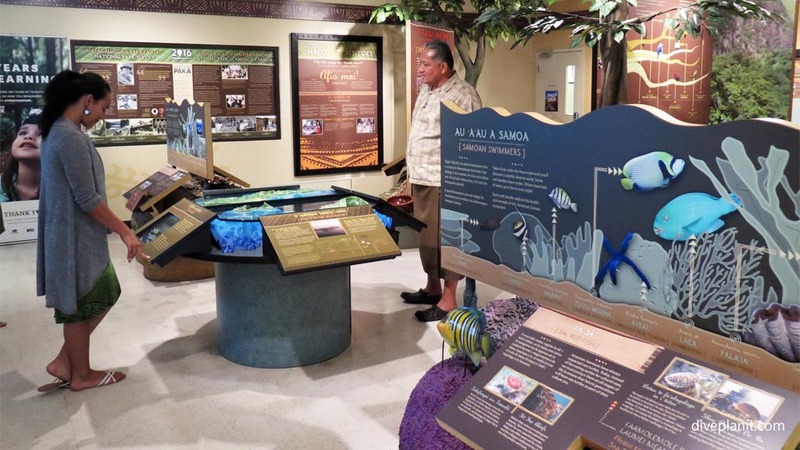 It houses some great displays illustrating many of the points of natural beauty, the diversity of local wildlife, more on the underwater world around American Samoa and its cultural heritage. There are trail maps for dozens of trails of varying degrees of difficulty and length and knowledgeable staff to help you plan any hikes you would like to undertake. Head down to South Pacific Watersports for a unique Stand Up Paddle (SUP) and snorkel tour on the reef right on their doorstep. Depending on the direction of the tide, you can SUP up or down the harbour reef, and then drift snorkel back to base. 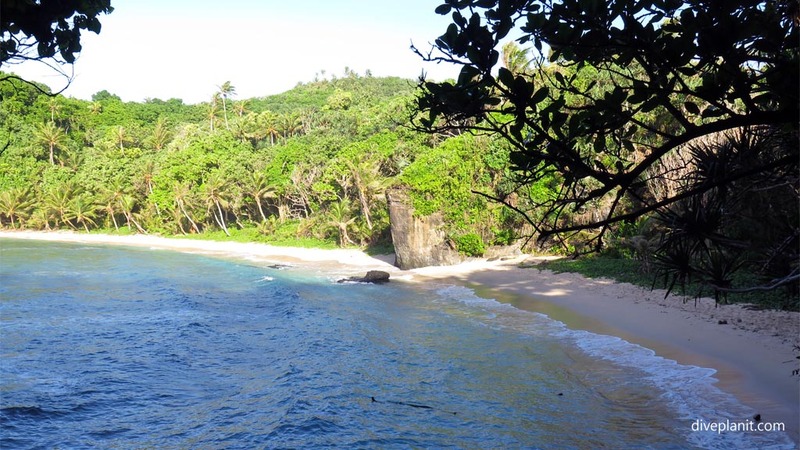 South Pacific Watersports also have a number of organised land tours and hikes, and a full gym with various machines and qualified coaches if you feel the need to work off the very generous portion sizes of American Samoan food. If you don’t have the opportunity to dive Aunu’u it still makes a pleasant day trip: it has a crater lake, quicksands, an impressive blow hole and a cultural tour including a taro plantation and umu food. Tours can be organised by Peter K Talivaa (peter.talivaa@noaa.gov). Best of all, it has great snorkelling and beaches. Humpback whales can be seen as early as July and as late as December, while peak time for whale sightings in American Samoa is between September and October. They travel north to breed and give birth to their young in warm waters and then pass by again on their way back to their feeding areas in Antarctica. American Samoa lies between two identified breeding areas, and even give birth in American Samoan waters. 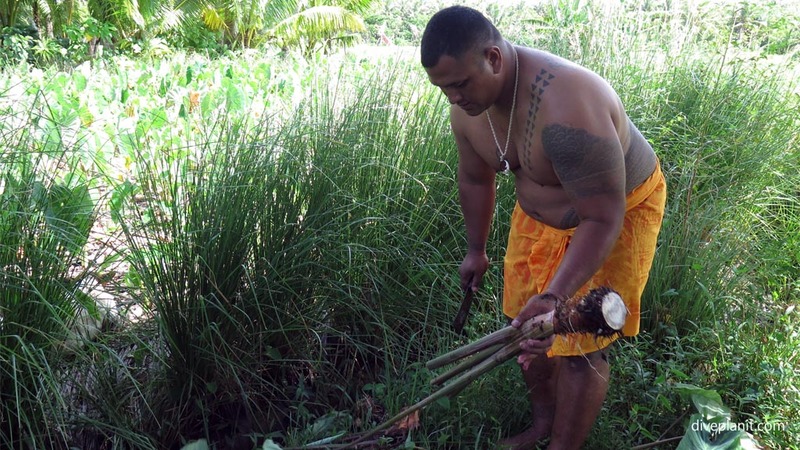 Samoa is a traditional society governed by Fa’a Samoa (the Samoan Way) – where family is all important, respect of elders is strictly adhered to, and being of service to your family is your duty. Always ask villagers for permission before taking photographs, using a (probably their) beach, or engaging in other activities, however unobtrusive your actions may seem. Permission will almost certainly be granted. In a traditional home, called a fale (fah-LAY), sit down on the floor before talking, eating, or drinking. Cross your legs or pull a mat over them; it is impolite to stretch out your legs uncovered. Sunday is the day for church, for rest, and especially for quiet around the villages. Activities that are acceptable on other days, such as swimming, may not be permitted on Sunday. Each evening around dusk, villagers observe a time for prayers called Sa. If you are entering a village during Sa, stop and wait quietly until Sa ends. You may even be invited to join in a family prayer. It is not necessary to stop for Sa on the main roads. It is considered an honour to be asked to share kava (a local drink made from the root of the pepper plant). To show respect, spill a few drops on the ground or mat in front of you, then raise your cup and say “manuia” (mahn-ooh-WE-ah) before drinking. Do not eat or drink while walking through a village. It is very disrespectful to walk in a village when a sacred ritual is in progress. 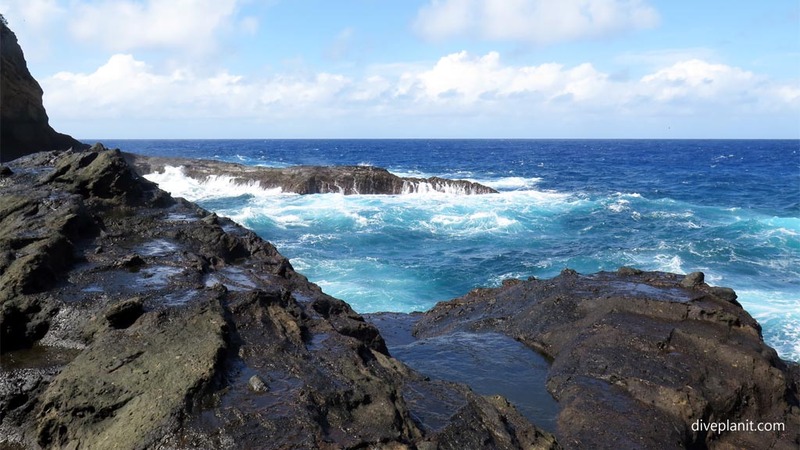 Here’s a detailed list of do’s and don’ts when arriving in American Samoa. Tourists wishing to stay longer than 90 days should apply for a single-entry visa in advance. 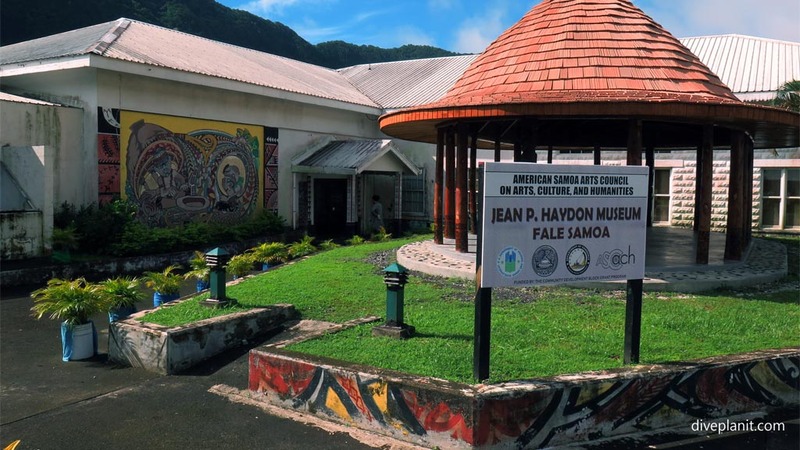 To enter American Samoa, a passport valid for a minimum of six months beyond the intended length of stay is required. The United States Dollar is the currency of American Samoa. Major foreign currencies can be exchanged at the local banks and at the Bureau de Change at the Airport. American Samoa has two major banks on island, the Bank of Hawaii and the ANZ Amerika Samoa Bank. Bank of Hawaii (BOH) is located in Utulei, ANZ Bank Amerika Samoa (ANZ) has branches in Fagatogo and Tafuna. Bank hours are 9am to 4pm and there are numerous ATMs dotted around the island. Shopping hours are Monday to Friday 8am to 5pm and Saturday from 9am to noon. Government offices are open Monday to Friday 8am to 4pm. American Samoa has a tropical climate all year round with two distinct seasons, the wet and dry season. The wet season is between November and March and the dry season from April through October with the average daily temperature around 28°C all year round. It always appears a few degrees cooler and less humid than Western Samoa, though the islands are only separated by a few 100 kms. Light cotton summer clothing is recommended all year round. Swimwear is appropriate for the beaches but when going to the villages please cover up or put on a t-shirt, shorts or wear a lavalava (sarong). If going to church on Sunday, slacks and shirt for men and a nice dress or blouse and skirt should be worn for women. If you’re not sure, feel free to ask somebody. As in Samoa, dengue fever is spread through mosquitoes and their bites, so be sure to regularly apply mosquito repellent containing DEET. Zika virus is also in American Samoa. Whatever medication you need, bring with you from your country of residence, as there are limited supplies for explicit medication in American Samoa. There is limited medical care in American Samoa, so observe a fair degree of caution, in general. Either drink bottled water or check before you drink the tap water, as most is not safe to drink. A gallon of water can be refilled at machines at many stores for 50 cents, so do not ruin your holiday by taking the chance with the tap water. There are also packs of stray dogs, which are territorial and often nip. To combat this threat the locals bend down and (pretend to) pick up a rock, (pretend to) throw at them, to scare them away. Bluesky is where you can find plans for a mobile phone, sim cards and internet connections, and cheap mobiles can be bought at local device stores. Some hotels have Wifi which can be purchased in units of time. American Samoa uses 110-volt electric current and plugs identical to those in the United States and Canada. 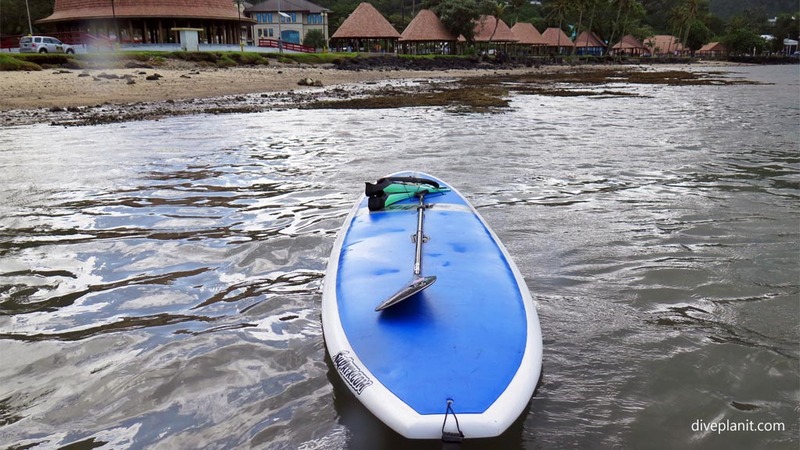 Even though it is an official U.S. territory, there is not a tipping custom in American Samoa, but the practice is not uncommon nor frowned upon. Visitors can fly directly from Honolulu, Hawaii and Apia, Samoa to American Samoa. Hawaiian Airlines offers two flights a week from Honolulu to Pago Pago on Monday and Friday nights throughout the year. During the peak seasons, Christmas and summer time, a third flight is added to the weekly schedule. Polynesian Airlines also offers daily flights from Apia (Fagali’i Airport) to Pago Pago International Airport as well as flights onto the Manu’a Islands. 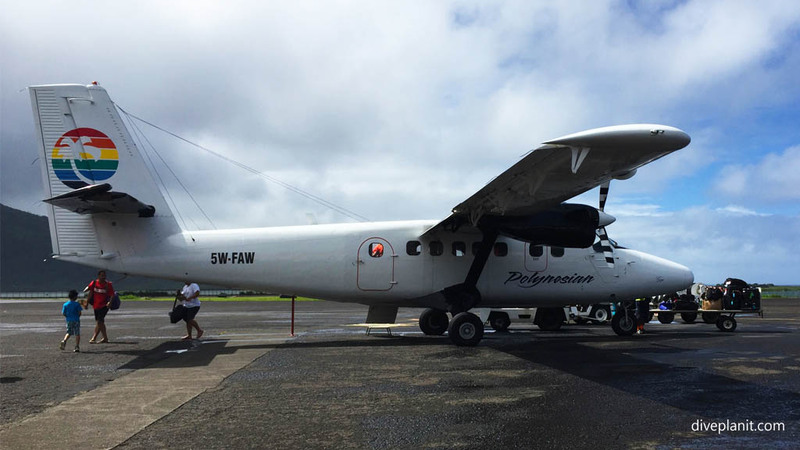 Air New Zealand, Fiji Airways and Virgin Samoa offer regular services from New Zealand, Australia, Fiji and Hawaii into Apia, Samoa where visitors can then connect with Inter Island Airways or Polynesian Airlines flights. Take your bootees and open fins rather than fitted fins. There are times when you will need to walk out over a coral rubble beach, or stony patch or rocks before actually getting into the water. 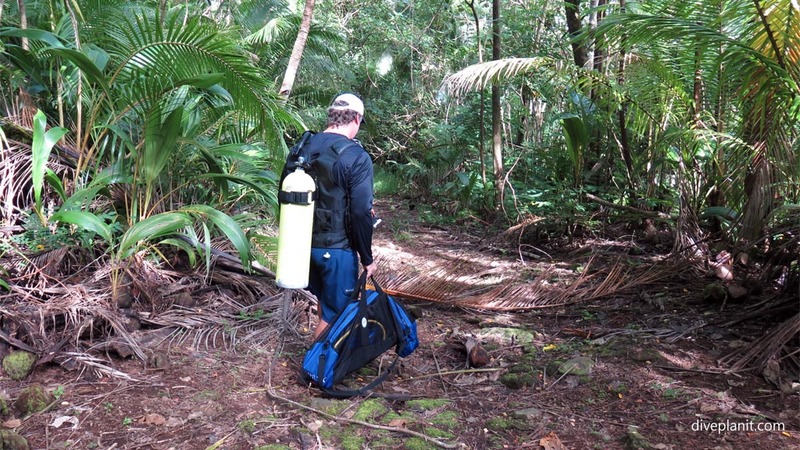 All you need for diving is a 3mm shorty or sharkskin – but take a rash vest too for SUP and snorkelling. Check your camera battery chargers and laptop adaptors. Most are able to use an input voltage of 100-240V. If they are only 220-240V input you may need to find a transformer rather than just an adaptor.